Audience: Armed Professionals or civilians that work in a team or routinely are with a partner. This is a Pistol and AR-15 course for two people who want to learn a way to systemically search a structure (home, workplace, etc) to look for loved ones or criminals when time is of the essence. Also for those wanting to learn close quarters shooting skills, room entry/search techniques and the ability to conduct room clearance solo or with a partner/team. If you do not have a partner to attend the course with, which is fine, we will pair you up on day one. Scope: This course is designed to teach students the fundamentals of room clearance/search and give them the skills to effectively/safely operate inside of a house/building. This curriculum is designed for students that have a working knowledge of their firearms and some experience shooting them. An entry level or first-time shooter will be overwhelmed in this course. This course taught both for law enforcement and non-law enforcement personnel regardless of your level of experience, we can tailor the curriculum to fit the needs of the group. 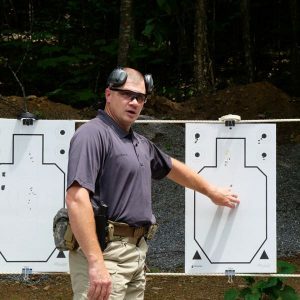 Classroom instruction and practical exercises on the range will provide the student with a solid understanding of one of the most complex areas of protection. During the course, all participants will learn the terms, techniques, and procedures to make them successful in room-to-room clearing or search and rescue after a shooting. Participants should be prepared to train in all weather conditions. This program is challenging and participants should come to class with an open mind and a good attitude. Training days are 8 hours, 8:30 am to 4:30 pm, with 30 minutes for lunch. It is highly recommend that you bring your lunch as you will have no options within 15 mins of the range. It is also recommended you have snacks, some will be available such as power bars, crackers and granola bars. Otherwise, please bring your own. Student must possess the physical strength and stamina to fire their firearms in prolonged shooting drills. Student should be physically able to get up and down from standing to kneeling. Light hiking boots or running shoes. NO open toed shoes allowed on Range!